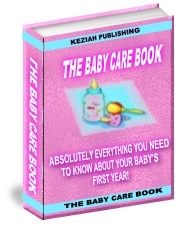 "The Guide That Every New Or Expectant Parent Simply Cannot Be Without - The Baby Care Book Will Teach You Absolutely Everything You Need To Know About Your Newborns Crucial First Year Of Life!" If you're a new (or expectant) parent then please take a few moments to consider this letter. I'm sure you know how important the first year of your child is, and as you're reading this you obviously want only the very best for your new baby. I'd really like to help you to give your child the healthiest and happiest start in life - and with the information, super-tips, and suggestions packed in this breakthrough new guide you'll be doing exactly that. Please stick around because you're about to learn some things that will have a profoundly positive impact on your child's entire life. You see, the first year of your baby's life is more important than you could possibly imagine. There are factors that you can control that will determine your child's ultimate IQ, motor skills, vulnerability to diseases, mood...and so much more. Frankly I cannot believe that anyone could even try and raise a baby without knowing these 64 pages of incredibly important facts, tips, suggestions and resources. This is knowledge that no parent should be without. The above is just scratching the surface of what's inside The Baby Care Book. Did you know that babies understand speech long before they actually begin to talk? The Baby Care Book not only shows you ways of speeding up your child's vocal development but also explains exactly what those "oohs" and "ahh" noises that she makes actually mean - and how you should respond to them. Every parent wants to see their baby start to talk as early as possible - so you'll want to know the daily actions you simply must take to speed up his ability to talk. Research has shown that doing these simple things can significantly develop your baby's ability to communicate effectively. The Baby Care Book also details how, as each month passes, what additional things you can do to continually help him advance his newfound language skills (by month eleven you'll even know what kinds of words to include when you talk with him, and why this is so important). These Little Known Methods Will Help Develop Your Baby's Motor Skills And Co-ordination! From the moment your baby is born she will begin the process of developing the motor skills that are vital for her to take command of her environment. Inside this guide you'll discover exactly why it is so important that you continually interact with your baby - and the specific things that you can do to help her brain development. You'll also learn why some countries have banned the use of "walkers" and why you should never get one for your baby (this may shock you). You'll also learn 4 little known methods of developing your baby's motor skills, and the simple activities that she can do to further develop her co-ordination. The Baby Care Book is packed with references, tables, charts and tips - it's packed with 56 pages of pure information which is a complete goldmine for any new parent. There are also several charts, tables and statistics to make your understanding as easy and interesting as possible. © 2013, All Rights Reserved by the Author of this ebook.